Two articles published in the journal “Nature” report the main results of the first year of work of ESA and Roscosmos’ Trace Gas Orbiter (TGO), part of the ExoMars program. One article concerns the impact of the global storm that covered the planet Mars with a dust on the water in the atmosphere, while the other article reports the lack of methane detections, at least for now frustrating the hopes of discovering its origin. A third article submitted to the journal “Proceedings of the Russian Academy of Science” offers the most detailed map created so far of water ice and hydrated minerals present immediately below the red planet’s surface. 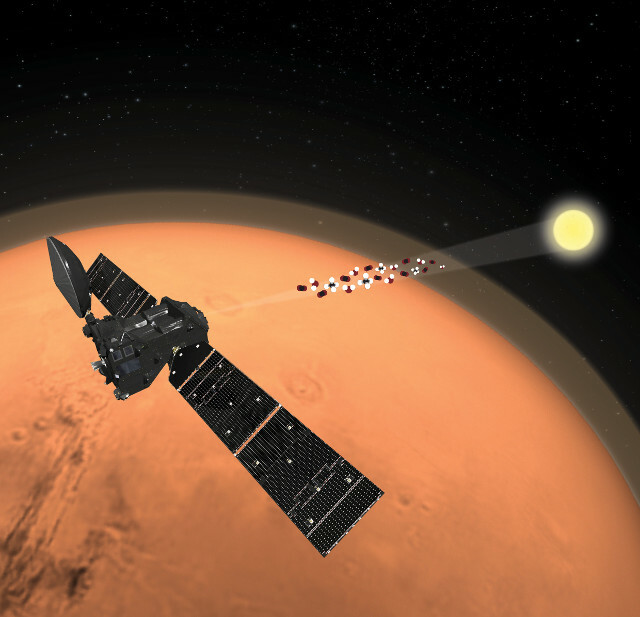 The TGO space probe reached Mars orbit in October 2016 but for over a year it carried out the maneuvers needed to lower its orbit to about 400 kilometers above the planet’s surface. Only in April 2018, it could finally begin its primary mission’s main phase, which is to study the Martian atmosphere with instruments capable of analyzing the gases present in small traces with much greater precision than any other previous instrument. One of the mysteries of Mars is the presence of methane, detected over the years by various instruments and also confirmed in a recent research. The TGO space probe provided in its first year of scientific mission the most detailed global analysis obtained so far but it’s a result that causes perplexity because the upper limit detected is 0.05 ppbv (parts per billion volume), a value between 10 and 100 times lower than all previously reported measurements. According to Oleg Korablev of the Institute of Space Research at the Russian Academy of Sciences in Moscow, principal investigator of the ACS (Atmospheric Chemistry Suite) instrument used for the detections, the result suggests a global absence of methane. These measurements seem at odds with previous findings and a solution may be in a process that destroys methane near the surface of Mars preventing it from reaching high altitudes. This is the result of a year of survey but the scientists who study the mystery of methane on Mars realize that they still have a partial picture of the situation, the reason why the TGO space probe continues its work. It’s not even clear what produced that methane over the years and that’s the most important question given that it could be a geological process but also a biological one. The ACS instrument, in this case together with NOMAD (Nadir and Occultation for MArs Discovery), was also used to study the water present in the Martian atmosphere. This task was influenced by the global storm that covered the red planet for months, having NASA’s Mars Rover Opportunity as its victim. In fact, the TGO space probe monitored the influence of the increase of dust on the water vapor present in the atmosphere. The two instruments allowed to map the distribution of water vapor and water containing a deuterium atom from the vicinity of the surface of Mars to over 80 kilometers of altitude. The top image (ESA/ATG medialab) shows how the TGO space probe’s instruments observe the absorption of sunlight in the Martian atmosphere to detect its composition. After the global storm began, it took only a few days for the water vapor in the atmosphere to increase dramatically. That’s no surprise because the models indicated that dust absorbs solar radiation heating the surrounding gas and making it expand, in turn redistributing other ingredients, including water, vertically. A greater contrast of temperatures between equator and polar regions is also generated with the result of strengthening atmospheric circulation. Higher temperatures allow less clouds of water ice to form, which would normally confine water vapor to lower altitudes. Water is present on Mars in the form of ice in the subsoil and the FREND (Fine Resolution Epithermal Neutron Detector) instrument mapped the distribution of hydrogen in the top meter of the red planet’s surface. Hydrogen indicates the presence of water or hydrated minerals. The map in the bottom image (ESA; spacecraft: ATG/medialab; data: I. Mitrofanov et al (2018)) is the first obtained but the survey will continue so it will be improved over time. Between confirmations and surprises, the TGO space probe is proving the its instruments’ excellent results as they already collected more precise data than a number of other instruments previously used on Mars. 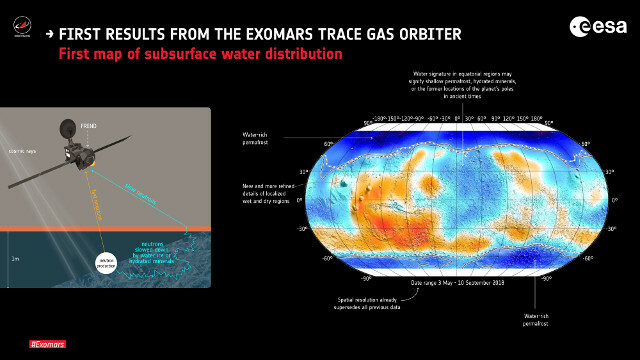 These are long and complex tasks but mysteries such as the one concerning methane could be solved also thanks to the data that will be collected during the ExoMars program.